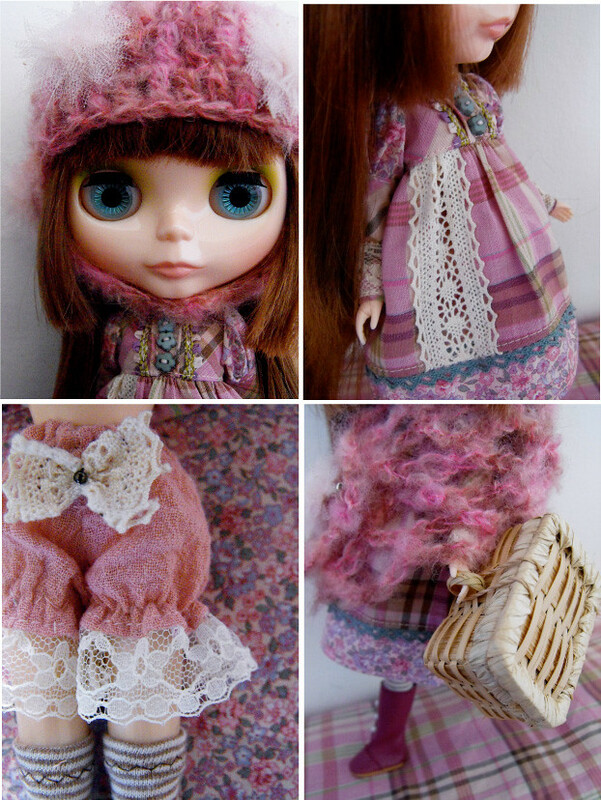 Crafty Girl, a special Bambina Carabina and Eurotrash collaboration doll! I’m very happy to introduce this special project me and Ruth are working on from some time now! 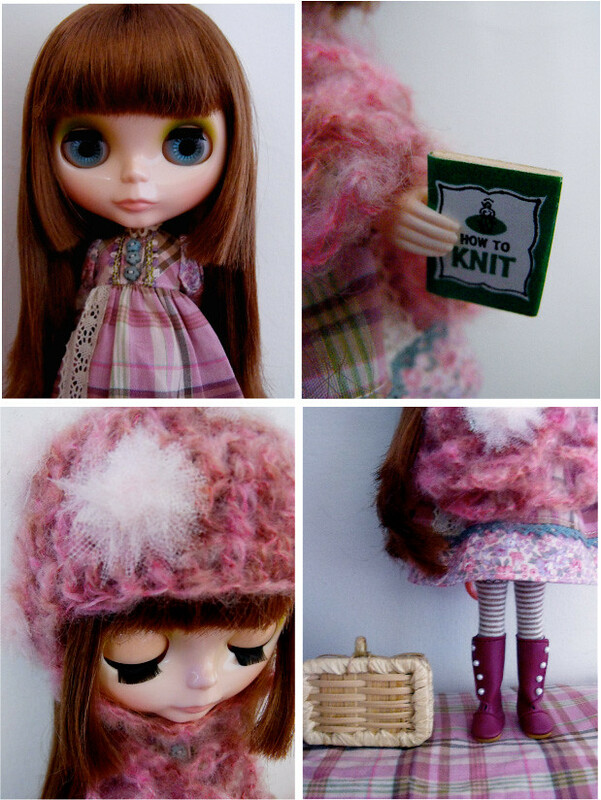 The base is a “Baby’s Breath” Blythe doll with a cute “Hime” hair cut. She has no flaws and no other customizations added. A EuroTrash Countess of the Empire dress in a lovely combination of plaid and vintage floral print. Accented with laces and trims from Japan. The bodice features pintucks with sage green buttons down the center placket, a neckline trimmed in lace and silk ribbon floral trim alongside the pintucks. The puffed sleeves are of floral print and cuffs of bias cut plaid are finished with a soft creamy lace. The skirt has an offset lace insert and at the hemband some sage green cotton lace as well. Short puffy bloomers in a rose colored cotton gauze are finished with wide cream lace and have an elastic waist and hem,featuring a little lace bow with a pearl center. Thigh high cotton striped stockings are of a coffee and cream coloured stripe providing a nice contrast for the entire outfit. A Bambina Carabina special edition Granny Hat crocheted with a gradient mohair that goes from pastel pink to a light plum one. Special “Powder Puff”flowers are hand made from 10 layers of hand cut pale pink tulle and they will be never replicated again. Hat closes on the side by a little metal hook that’s completely hidden under the wool. Oversize scarf is made by the same gradient mohair in a crochet lace technique. It can be closed with a metal pin with one “Powder Puff” flower sewn on. Crafty Girl will come with a special straw trunk full of miniature tools: a pair of moveable tiny scissors, a pile of jaquard fabrics scraps, some miniature yarn balls and a tiny knitting book. Burgundy boots are included in the auction too. She will be up on ebay for a 7 days running auction from today. Please feel free to ask me more details and infos. I hope you’ll like her! A percentage of the sale will go to the Japan Earthquake and Tsunami Relief Fund.